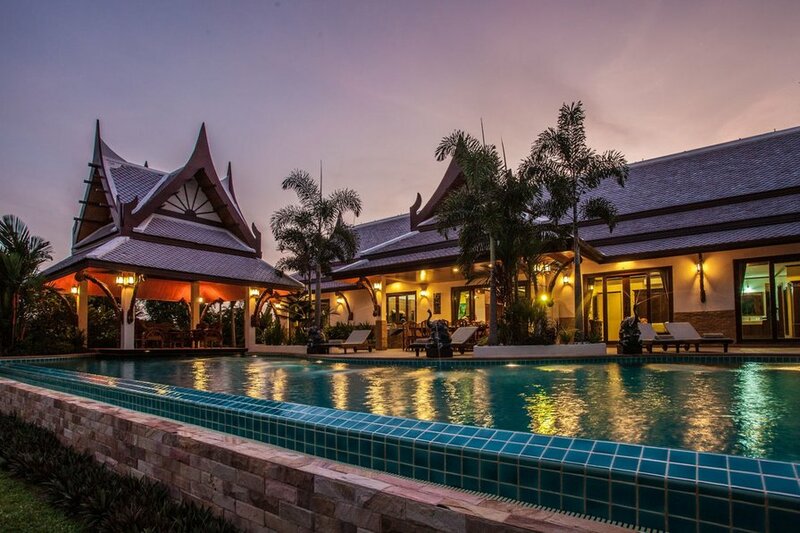 Villa Saifon is a large, modern Thai style, 5 bedroom pool Villa presenting 3 beautiful King-size master bedrooms with luxury en-suite bathrooms, plus two more tastefully decorated & comfortable queen-size bedrooms. The spacious living room is furnished with a large, very comfortable sofa set and solid teak furniture. The living room is fitted with a 64" Samsung Smart-3D TV along with a Blue-Ray/DVD surround sound home theater system. Also included is the UBC Platinum package satellite and Wi-Fi internet to accommodate all your entertainment needs. The dining room is furnished with a beautiful, custom made, solid teak dining set with seating for 10 people. Villa Saifon's large kitchen is fitted with teak cabinets and beautiful granite counter tops imported from Italy. The kitchen is fully equipped for all your cooking needs including a large gas oven with 5 stove-top burners, large fridge/freezer, microwave oven, coffee machine, espresso machine, toaster, rice cooker, blender, quality cookware, and of course, a gas BBQ outside. Step outside and you will begin to enjoy the true meaning of tropical living. Under a large covered terrace area is a large wood table that seats 10 people. Looking over the pool and private lake with the mountain backdrop, this will naturally become your favorite place to enjoy your time with family and friends. On the other side of the pool is a large sala, (covered seating area) another great place to relax and enjoy the sights and sounds of this natural setting. Villa Saifon's most spectacular feature is the 19meter infinity edge pool with a tropical waterfall feature. It is likely the biggest private pool in the area. It has 4 in-water bar stools against a counter bar positioned along the edge of the sala as well as a pool-side shower and outside washroom. The views from in, and around the pool, are simply awesome. If you are like most of our previous guests, you will be in the pool just moments after your arrival. Villa Saifon's bedrooms are fit for a king. All have solid teak furniture, quality mattresses, and luxury bedding. Two poolside master bedrooms with beautiful en-suite bathrooms featuring separate bath and shower with private toilets. The beds and furniture are exquisitely hand carved, reclaimed teak, imported from Burma. These two bedrooms are fitted with high-quality Samsung LED TV's with the Platinum package UBC satellite feed. Large glass doors open up to a view of the pool with the lake and Limestone mountain in the background. Absolutely stunning in the morning with the sun coming up over the limestone mountain. One poolside queen-size bedroom beautifully appointed with solid teak furniture. This bedroom is fitted with a Samsung LED TV with the Platinum package UBC satellite feed. Large glass doors open up to a view of the pool with the lake and Limestone mountain in the background. One King-size en-suite master bedroom at the rear of the house with garden views. Beautifully furnished with solid teak furniture. This bedroom is fitted with a Samsung LED TV with the Platinum package UBC satellite feed. One queen-size bedroom off of the living room fitted with solid teak furniture and an LED TV with the Platinum package UBC satellite feed.